You don’t hear about announcements like this everyday. 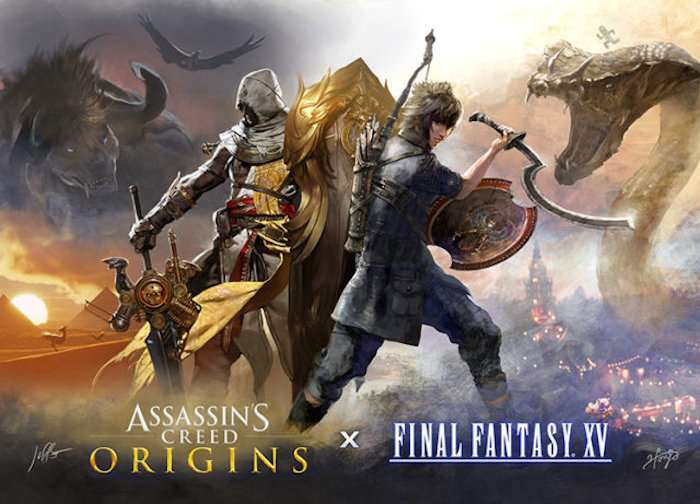 Ubisoft and Square Enix have confirmed an Assassin’s Creed and Final Fantasy crossover. Yes, it is happening! The two development teams will be “paying homage to each other’s gaming universes” in this new collaboration. They have unveiled a piece of artwork at this year’s Gamescom that features Bayek from Assassin’s Creed Origins and Noctis from Final Fantasy XV. There have been easter eggs hidden by the teams to hint at the unofficial start of this partnership. One easter egg was included in the latest Assassin’s Creed Origins Gamescom trailer. If you are a fan of both franchises, this is great news. This partnership begins on August 30 when Final Fantasy XV players who have obtained the Dream Egg from the Moogle Chocobo Carnival event will get a familiar Assassin outfit for Noctis. The free Assassin’s Festival DLC will be released for Final Fantasy XV on the next day. This DLC will transform the town of Lestallum and new activities will be available for players to participate in. I wonder what else they will do. It could lead to bigger things.